Corn (maize) originated in Mexico, and has long been the staple subsistence crop among Mexico’s campesinos, as well as being one of the essential ingredients in Mexico’s varied cuisines, from tortillas to tamales, and pozole to enchiladas. It was recently announced that Mexico’s federal Agriculture Secretariat is financing a germoplasm bank to preserve the genetic diversity of Mexico’s native varieties of corn. 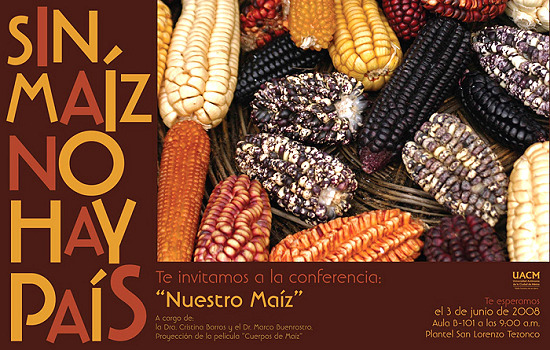 The facility is located in the Antonio Narro Autonomous University of Agriculture (UAAAN) in Saltillo (Coahuila), and will eventually house up to 100,000 samples of 60 distinct varieties of corn supplied by farmers from all over the country. The first seeds have already been deposited in the germoplasm bank by farmers from the state of Puebla. The University plans to add an interactive museum of corn and a seed-production division at a later stage. Helping to ensure that corn’s genetic diversity is preserved for future generations is an invaluable contribution towards future global food security. Mexico’s corn-based cuisine, specifically that of the state of Michoacán, was recently accorded status by UNESCO as a vital part of the country’s Intangible Cultural Heritage. Our grateful acknowledgment to Cristina Potter of MexicoCooks! and MexConnect for bringing much of this material to our attention.